Genetic information is stored in structures called chromatin, which is made out of DNA combined with small protein molecules known as histones. The functions of DNA are the focus of this biology study guide unit. The first function considered is replication, where DNA makes a copy of itself, thus ensuring the transfer of the correct genetic information to daughter cells. Errors in this process are mutations—which is actually a second function: the ability to change and thus produce new genetic combinations. When replication is completed, the chromatin coils about the histones, becoming more densely packed and visible. The resulting structures are the chromosomes, which can be observed microscopically during cell division. Between active stages of cell division, DNA exists in its unwound form and is engaged in controlling cellular activities by governing the synthesis of proteins—its third function. To do this, other molecules like RNA and specific enzymes interact with the DNA to communicate its genetic message to ribosomes in the cytoplasm, where protein synthesis occurs. The DNA study guide unit concludes with a consideration of biotechnology, which has now developed to the point where scientists can manipulate chromatin directly. During recombinant DNA procedures, for example, segments of genetic information are removed from their cells and inserted into host cells, producing “hybrid” cells with new characteristics and capabilities. 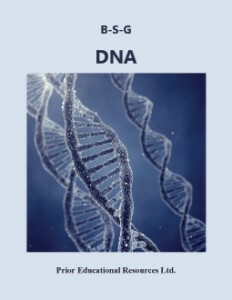 DNA is excerpted from our Biology 12 Study Guide, which is the sixth edition of a student study guide written to match the curriculum of British Columbia. The concepts presented are applicable to the biology curricula of other educational jurisdictions as well.